Place a saucepan on the stove over medium heat. Lightly sprinkle with cooking spray. Add half of the cheese, turkey, and tomatoes to the tortilla and finish with the rest of the cheese. Cover with the other tortilla. Place the quesadilla on the saucepan and cook for 3-5 minutes on each side until the cheese is melted and the quesadilla is lightly browned on the outside. Serve immediately with slices of avocado. You can use chicken breast if you like. Now that the kids will be home for summer vacation, we will need tasty, healthy and easy lunch recipes. 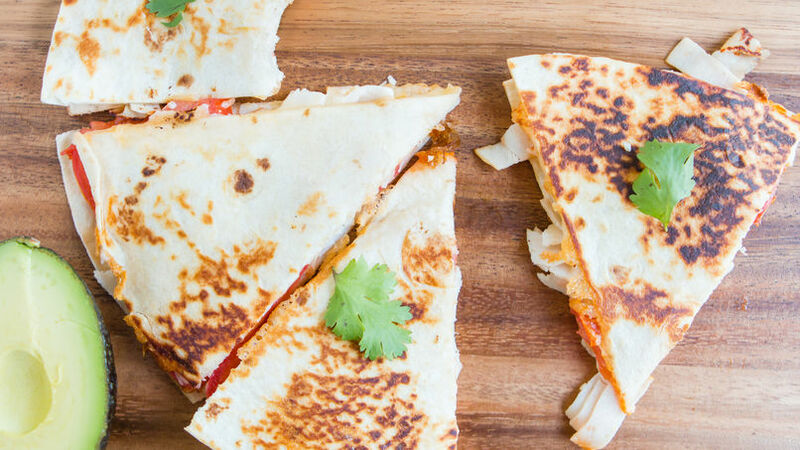 This recipe for turkey and cheese quesadillas is one of my favorites. It can be prepared in a jiffy and kids love it. It’s also perfect for a picnic! Just prepare them, wrap them in aluminum foil and you’ll be ready for your adventure! Happy summer!